Spunky and raring to go in Clear White, our One Owner, Accident Free Kia Soul ! is waiting for you! The TurboCharged 1.6 Liter 4 Cylinder offers 201hp with its responsive 7 Speed Dual Clutch Automatic transmission. This Front Wheel Drive combination delivers near 31mpg on the open road with impressive acceleration and awesome maneuverability. Examine our photos and see our fresh-faced Soul ! looks sleek and sophisticated, and stands out among its peers with attitude and style that is enhanced by a distinct grille, HID headlights, front fog lamps, panoramic sunroof, and great-looking alloy wheels. Open the door and you'll be impressed with the surprisingly spacious cabin with power-adjustable heated leather-trimmed front seats, heated rear seats, push-button start, a heated leather-wrapped sport steering wheel with mounted controls, power windows/locks, automatic temperature control, a front-seat center console with armrest, a 60/40 split folding rear seat, and more. It's easy to stay seamlessly connected and listen to whatever tunes suit your mood with the UVO Infotainment system that features a touchscreen display, Bluetooth, available WiFi, Android Auto, Apple CarPlay, Navigation to help you on your way, and the premium Harman/Kardon sound system with front door speaker lighting and available SiriusXM radio. Safety is top priority, and our Soul takes care of you by giving you what matters most. Quality construction, rear camera display, blind spot detection, six airbags, anti-lock braking, brake assist, and electronic stability control combine to provide you with peace of mind. Put some zip in your day with stand out style, practicality, and efficiency. Reward yourself with Soul! Print this page and call us Now... We Know You Will Enjoy Your Test Drive Towards Ownership! Your buying experience with ABQ Auto Deals is our number one priority. 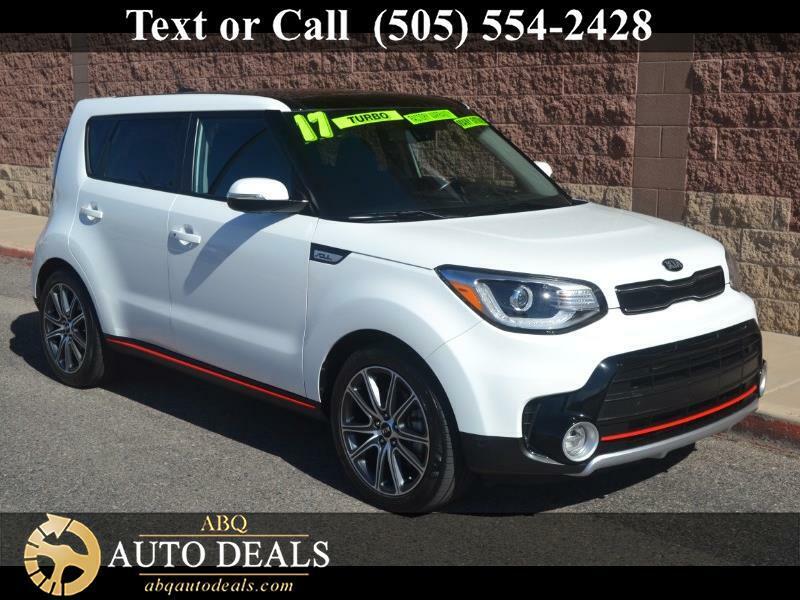 Vehicle Inquiry for 2017 Kia Soul !